July 1, 2011 -- On sandy beaches, hidden beneath rocks and driftwood, there are mothers with problems. Assistant Professor of Biology Andy Zink and his students have published new research on the parenting dilemmas faced by maritime earwigs as they try to defend their nests against cannibalistic invaders. Maritime earwigs (Anisolabis maritima) live on beaches and are related to the European earwigs that are often seen in homes and yards. 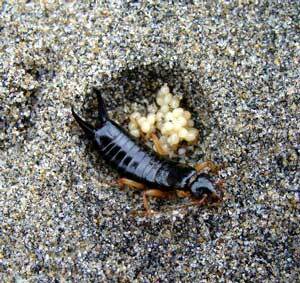 Along the high tide line, maritime earwigs make their nests in excavated chambers of sand or soil underneath rocks and logs, defending their eggs for three weeks until they hatch. The problem for these dark, inch-long insects is that other female earwigs want to eat their un-hatched eggs, which are full of protein. This threat of egg cannibalism comes from their closest neighbors. Underneath a single log, there can be dozens of females, with nest chambers back to back like row houses. "An invading female pokes her back end into the mother's nest first. The backside is where their sharp forceps are," said former graduate student Julie Miller. As part of her master's thesis, Miller studied nest invasions in the lab, including video recordings of conflicts between females. "The invading female earwig waves her forceps in an aggressive dance," Miller said. "The two females then interlock forceps and grapple with one another. It's usually the larger female that wins the contest, by chasing off or ripping a hole in the body of the smaller one." If the invading female wins the contest, her prize is being able to eat all of the nesting female's eggs, usually about 40 eggs per nest. However, larger female nesters are able to repel invaders and keep their eggs alive. Zink and Miller's findings suggest that the fighting required of mother earwigs could influence the evolution of larger body sizes among females. "Our analysis showed that larger females have an advantage over smaller females and are more likely to win the fight against an invader," Miller said. Mothers from all earwig species guard their eggs, but this is the first study to directly test if one of the benefits of maternal care is to prevent egg cannibalism. In lab experiments, Miller removed moms from nests and then introduced a female invader. She found that the mother's presence was essential for preventing eggs from being eaten. Miller believes that maternal care may go hand in hand with maritime earwigs nesting so close to each other and that the risk of cannibalism may have influenced the evolution of parental care in this species and in other earwig species. For Zink, the research raises interesting questions about the tradeoffs that female earwigs have to make. For example, a mother may flee the nest instead of fight, allowing her to reproduce again in a few days or weeks, or may eat her own eggs to bolster her strength for future reproduction. "Studying these insects helps us understand the basic selective forces in nature that shape the evolution of parental care and social behavior in other animals, including humans," Zink said. "The choices that earwigs have to make, to advocate for their offspring, mirror the tradeoffs that humans face around the costs and benefits of parenting."